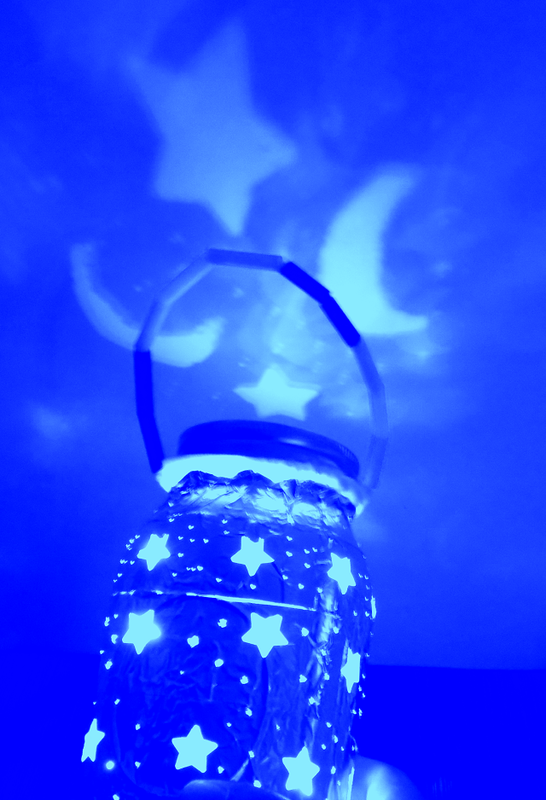 This past weekend, my oldest daughter and I kicked off the summer season, by crafting this super fun DIY Shape Projecting Lantern. When placed in the dark, the glow of the battery operated lights casts the moon and star shapes all over the surrounding surfaces, ceiling and walls. 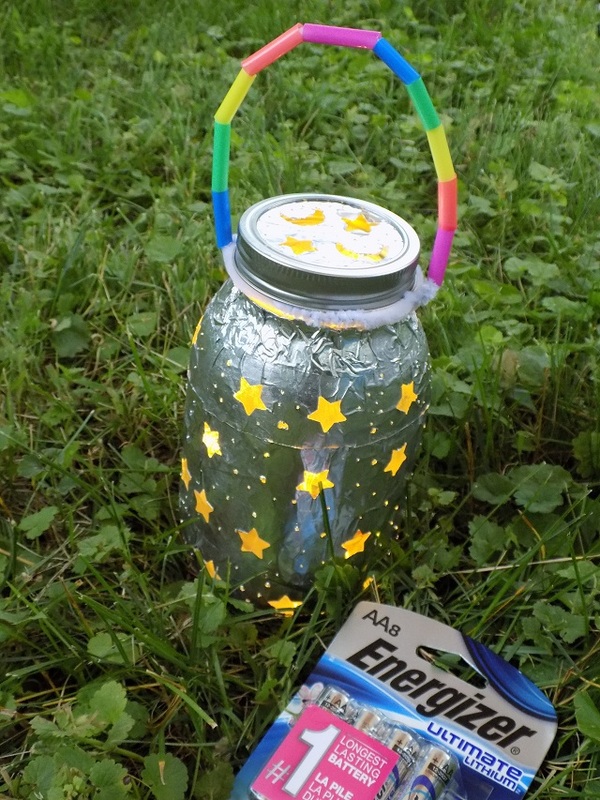 This DIY lantern craft was so simple to make, and all of the kids are absolutely LOVING the finished product. My toddlers are completely mesmerized. This was a total craft WIN! Hi friends, how have you been? SUMMER. It's finally here. I can't even tell you how excited I am! I feel like a kid again. For real. So, as I told you all a few months back, we've ditched the electronics (almost entirely!) with the older kids. They have very limited access to the Internet for school, and not much else. Can I just tell you, the difference, is nothing short of amazing. Amazing, folks. They're reading again; for fun! They're going to the library to learn (real solid facts and all of the supporting information. Bye-bye Wikipedia!) They're creating and crafting. They're actually talking; they're not absorbed in screen time or social media. It's glorious. I'm never turning back. This is the way that childhood was intended to be. There's plenty of time for screens when they're all grown up. For now, they just need some uninterrupted time to be kids. The agenda this summer is pretty simple. Sunshine, aquarium and zoo visits, museum visits, a camping trip close to home, hiking, pool time, water park visits, backyard fun, crafting and creating, reading and picnics. Lot's of picnics. Simple, good old fashioned, fun. Friends, despite our lack of grandiose plans, I have a feeling that this summer is gonna' be one for the books. Bring on the fun! Ready to kick off the summer fun with your family? 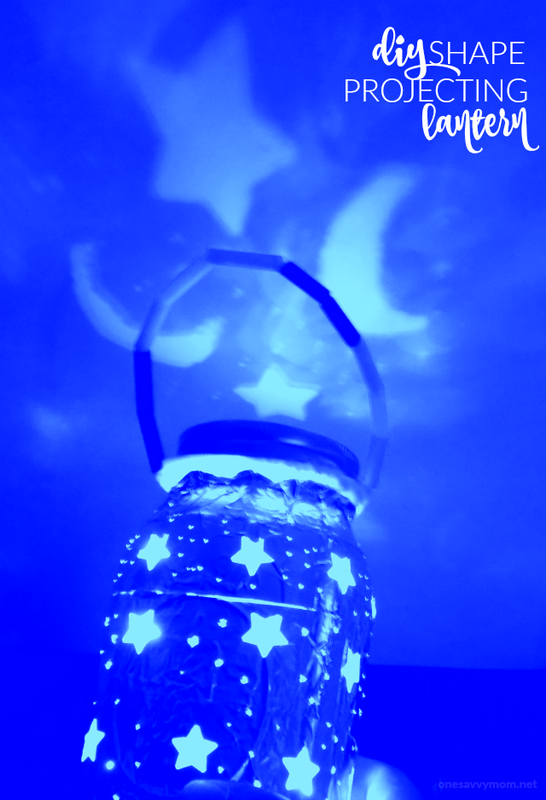 Read on for the full supply list and our simple tutorial, to make your own DIY Shape Projecting Lantern craft with the kids this summer. Next, I made a quick stop at the craft store, and we were set. 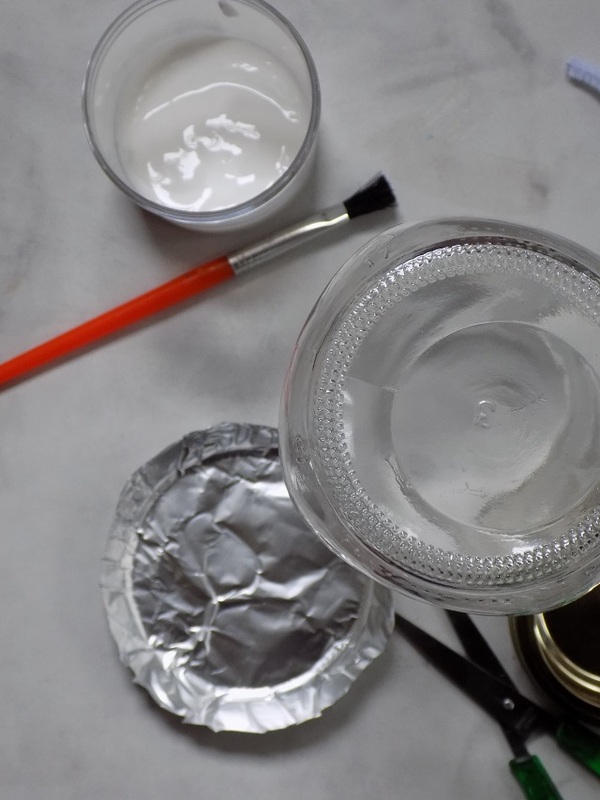 Using aluminum foil and scissors, cut a large circle of foil (large enough to cover the bottom of your jar. Turn your jar over (bottom side up). 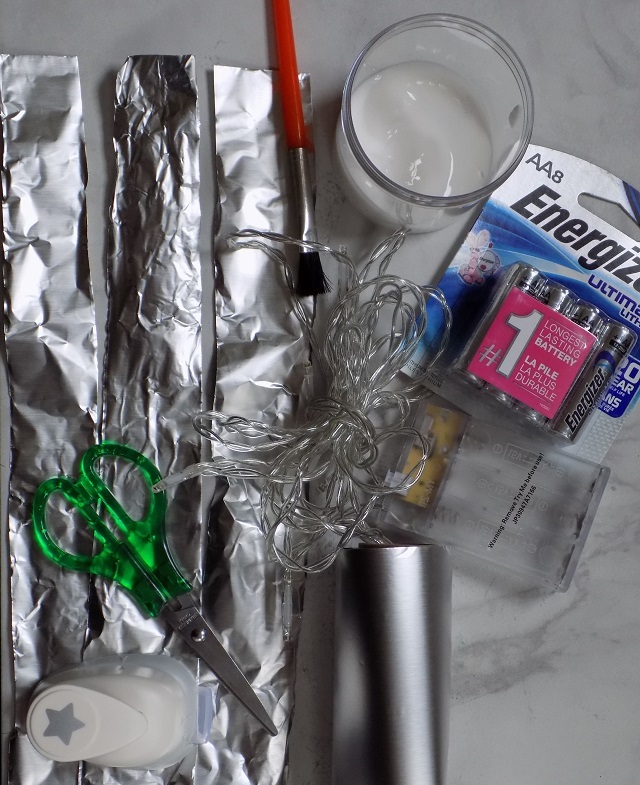 Using a paint brush and white school glue, cover the underside surface of your foil (the dull side) with glue. Next, press the foil to the bottom of the jar. Now, place the jar bottom side down. Set to the side. Cut several long strips of aluminum foil (about 2"H x 12"L.) We used 10 strips to cover the pictured jar. 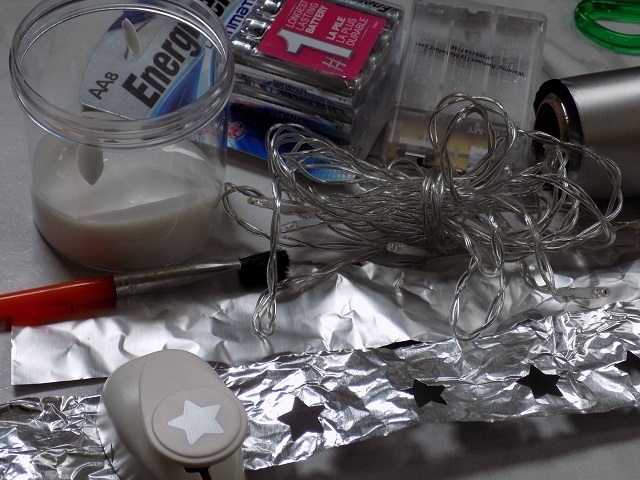 Using a paint brush and white school glue, cover the underside surface (the dull side) of your star punched foil strips. 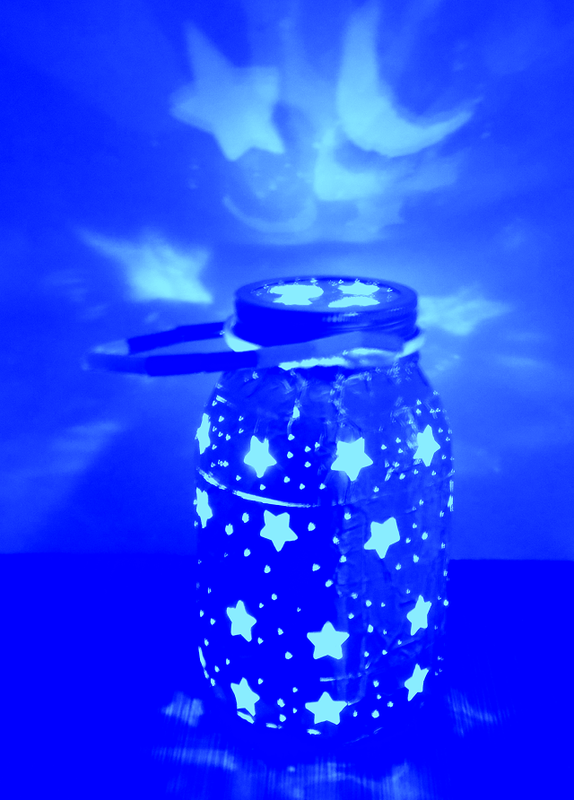 Press / affix your foil to your jar (working your way from the bottom up. 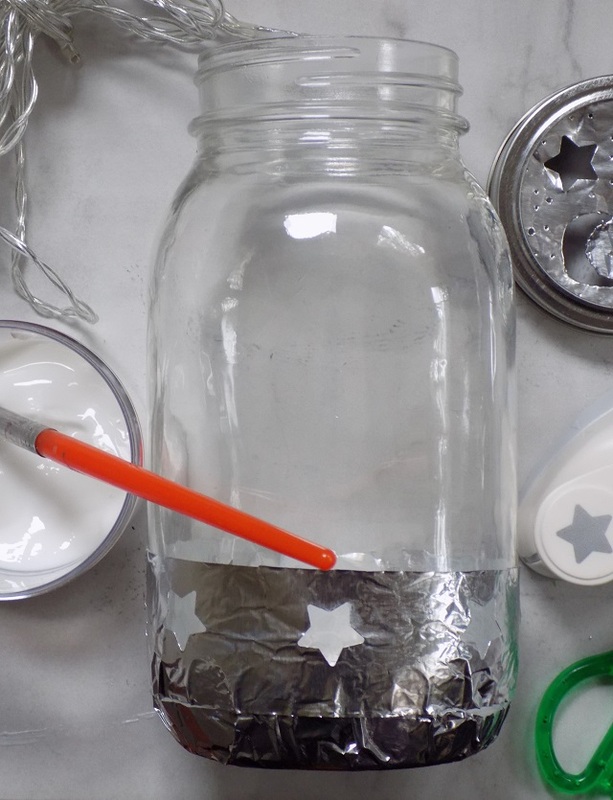 Repeat step 7 to affix each of the star punched foil strips to your jar, until the entire surface is covered (up to the mouth of the jar.) Set your completed foil covered jar to the side. Allow adequate time for the glue to dry. Next, using a ball point pen, trace the inside circle of your jar ring lid (the removable sealing metal center). Cut your foil to size. Use your star punch to punch 2-3 star shapes. Use the tips of your scissors to gently cut 1-2 crescent moon shapes. 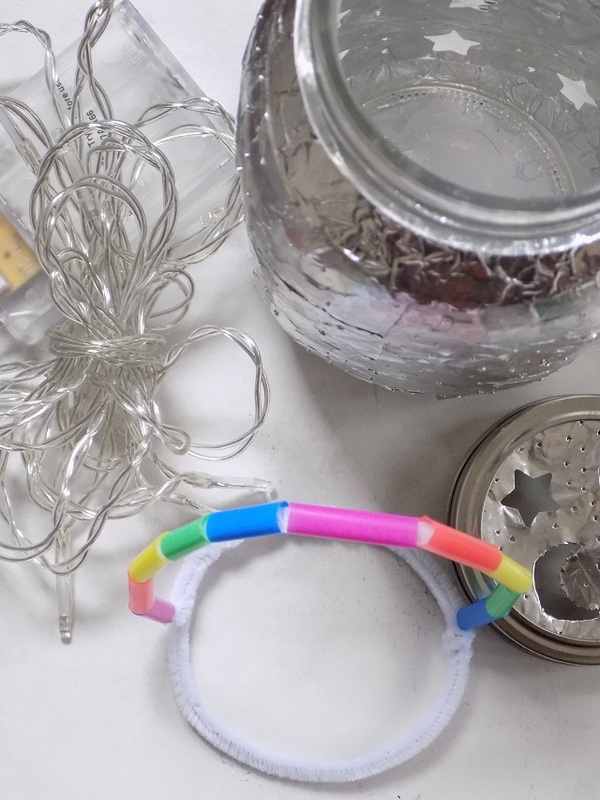 Using a paint brush and white school glue, affix your foil center to the lid ring for your jar (refer to images below) so that the light can shine through the top of the lid and project the shapes onto the ceiling / walls. Note: this punched foil piece will replace the sealing metal center. Set the lid to the side. Allow adequate time for drying. Place your Energizer® Ultimate Lithium™ batteries into the battery pack for your battery operated light strand. Place the battery pack / battery operated light strand inside your completed DIY Shape Projecting Lantern, secure the ring top / lid in place. Wait for night fall, and enjoy the beautiful light/shape projections of moons and stars dancing on all of the surfaces, walls and ceiling! So pretty! online, or by downloading the Walgreens App. Earn points every time you shop, and turn your points into dollars off your future purchases at Walgreens. It's that simple. 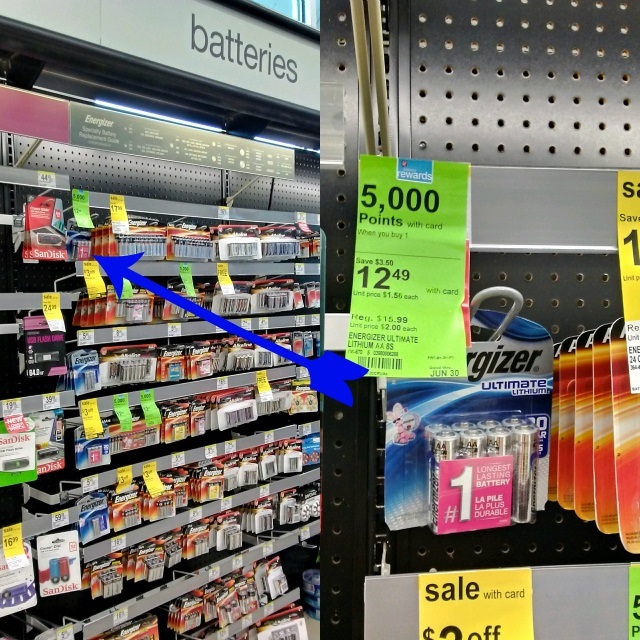 Power your summer fun with Energizer® Ultimate Lithium™ batteries from Walgreens. Friends, get out there and make some spectacular memories with your kids this season. Let's all make this summer, one for the books! 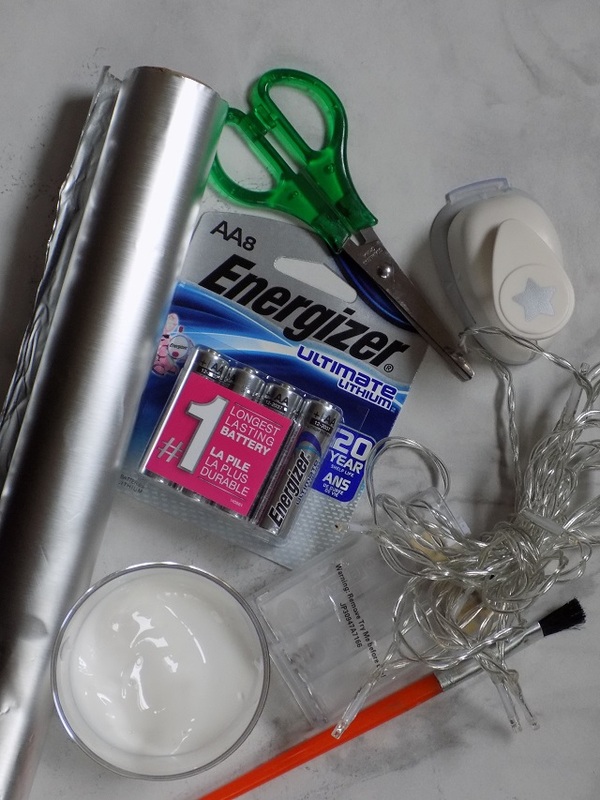 What will YOU make and power with Energizer® Ultimate Lithium™ batteries this summer? I'd love it if you'd share in a comment below! Happy crafting and happy summer! I'm looking forward to trying this with my twin daughters. Thank you for posting such a awesome craft.